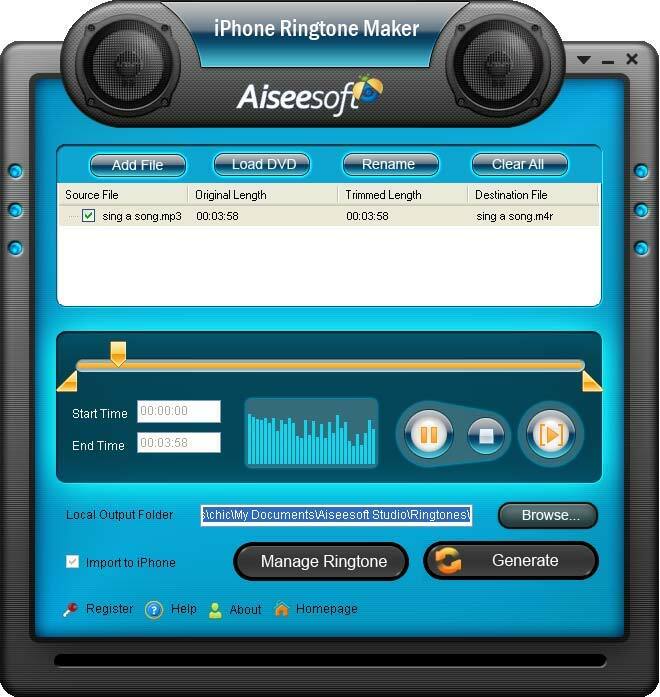 Aiseesoft iPhone Ringtone Maker is the best assistant to make ringtone for your iPhone, iPhone 3GS, iPhone 4, iPhone OS 3.0/3.1/4.0 from your own video and audio sources, DVD files. Aiseesoft iPhone Ringtone Maker can convert a wide range of video and audio formats like AVI, MPEG, WMV, MP4, FLV, etc to iPhone Ringtone M4R and transfer to iPhone directly without iTunes. You even can convert DVD to iPhone M4R ringtone. Convert a wide range of video and audio formats to iPhone Ringtone M4R. Aiseesoft iPhone Ringtone Maker allows you to get any clips from your video and audio sources, edit it and make it as your ringtone. It provides you the easiest and quickest way to make ringtone by yourself. Just use the wonderful tool to generate different ringtone for your different friends. Aiseesoft iPhone Ringtone Maker can make almost all the audio files to M4R as the iPhone ringtone, including MP3, WMA, AAC, WAV, OGG, M4A, RA, RAM, AC3, MP2, etc. With Aiseesoft iPhone Ringtone Maker, you can convert any video formats including AVI, MPEG, WMV, MP4, FLV, MKV, H.264/MPEG-4, DivX, XviD, MOV, RM, RMVB, M4V, VOB, ASF, 3GP, 3G2, H.264, QT, MPV, etc. With the assistance of Aiseesoft iPhone Ringtone Maker, it is easy to convert your DVDs to iPhone ringtone compatible format - M4R. Convert mp3, wav files and CD tracks to ringtone format. Fun Ringtones toolbar for Internet Explorer. Qweas is providing links to Aiseesoft iPhone Ringtone Maker 4.0.20 as a courtesy, and makes no representations regarding Aiseesoft iPhone Ringtone Maker or any other applications or any information related thereto. Any questions, complaints or claims regarding this application Aiseesoft iPhone Ringtone Maker 4.0.20 must be directed to the appropriate software vendor. You may click the publisher link of Aiseesoft iPhone Ringtone Maker on the top of this page to get more details about the vendor.